Andragogical Studies is a scholarly peer-reviewed journal, devoted to theoretical, historical, comparative and empirical studies in adult and continuing education, lifelong and lifewide learning. The journal reflects ideas from diverse theoretical and applied fields, addressing the broad range of issues relevant not only for Serbia, but also for the whole of Europe, as well as for the international audience. The journal publishes research employing a variety of topics, methods and approaches, including all levels of education, various research areas – starting with literacy, via university education, to vocational education, and learning in formal, nonformal and informal settings. Innovative and provocative scholarship informed by diverse orientations and methodologies is encouraged. 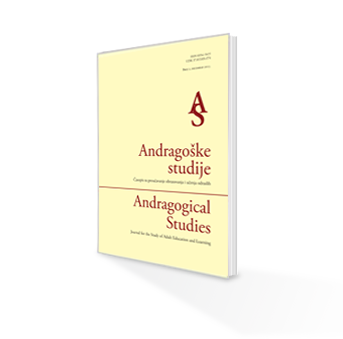 Andragogical Studies was launched in 1994, and since 2002 the journal is published twice annually. By the decision of Ministry of Education, Science and Technological Development the journal is categorized as the iternational journal (M24). ERIH PLUS - European Reference Index for the Humanities and Social Sciences. The journal is classified as a peer-reviewed international academic/scientific journal. The journal publishes texts which haven't been published previously. Editorial Board receives only MS Word type electronic submissions sent to e-mail: ipa@f.bg.ac.rs or to the Institute for Pedagogy and Andragogy, University of Belgrade, Faculty of Philosophy, Čika-Ljubina 18-20, 11000 Beograd. All papers submitted should be between 30.000 and 60.000 characters (with spaces), in Latin letter. Abstract should also be submitted of no more than 1000 characters (with spaces), the title of the manuscript, as well as 3-5 keywords. Submissions should include: full name, institutional affiliation and position of the author; basic data on author (up to 250 characters with spaces) and the contact information, as well as the date of birth (will not be published, serve just for the catalogue). If there is more than one author, the information should be provided for each author. Articles should be structured using up to two levels of headings. Numbering should not be used in headings. Italic formatting is allowed for emphasizing. Bolding, underlining and other such formatting are not allowed. Figures, pictures and tables should be named and numbered by Arabic numerals, and supplied in a form suitable for reproduction. Serbian, English, German, Croatian, Bosnian and Montenegrian languages are acceptable languages. Papers will be published in Serbian (as well as Croatian, Bosnian and Montenegrinian) and in English. For papers published in English additional abstract in Serbian will be provided by Editorial Board, while for papers published in Serbian additional abstract in English will be provided. References to literature should be placed in the text, within parentheses. It is acceptable to use footnotes, however, it is recommended to use them only if necessary e.g. for comments and additional text. All quotations should be referenced using APA Citation Style (American Psychological Association). See: Publication manual of the American Psychological Association (6th edition). (2010). Washington, DC: American Psychological Association. Bibliographic references in APA style should be listed alphabetically at the end of the paper. It is the contributor’s responsibility to ensure that all references and citations are correct. AS editorial staff initially reviews all manuscript submissions for compliance with AS editorial policy. If the manuscript fails to fall within the scope and stylistic guidelines of the journal, it is returned to the authors. If a manuscript is in accord with the scope of the journal and meets submission guidelines, all references to the author name and institution are removed from the manuscript, and it is submitted for blind reviews by two external reviewers at the discretion of the Editorial Board. Each consulting editor is a professional scholar judged, affiliated with an academic institution and competent to appraise such manuscripts. In compliance with advice of consulting reviewers, the editors make one of tree decisions: accept; conditional accept; or reject. In the case of conditional acceptance, the editors will specify necessary revisions in writing to the author. When revisions are completed and the editors accept a manuscript, the editors will then notify and inform the author(s) about the next steps in the publication process. Papers which receive positive reviews are published, and authors are informed beforehand. The editors determine the order of articles. Reviewed articles are categorized as follows: original scientific articles, review articles, professional articles. The journal publishes also translation of relevant documents (or, exceptionally, translation of papers published elsewhere), chronicles, scientific reviews, polemics and interviews, bibliographies, information about current projects, events and publications in the national, European and global adult education and learning field. Importance of the Problem: A problem or subject addressed by a manuscript should contribute to knowledge or theory pertinent to adult education and learning. Importance is enhanced when a paper promotes understanding or improvement of practice. Background: Through the abstract and a brief introduction, readers should be provided with sufficient background information/literature to understand the problem being addressed. Problem/Purpose: The purpose of the paper should be clearly and unambiguously stated. This typically requires a clearly described research problem. Literature Review: Research and scholarship should be linked to relevant empirical and theoretical literature. The applicability of the research and the quality of the discussion are more important than the length of the literature review. Methodology: The approach and procedures must be appropriate for addressing the stated research problem(s) and purpose(s). Findings: Findings must be presented and documented to show clear relationships to the purpose(s) and research question(s). Evidence needed to support conclusions must be clearly identified and amply arrayed, including (but not limited to) the presentation of statistics, charts, and graphs; use of quotations; observational data; references; and citations. Conclusions: Conclusions and logical inferences should be pertinent, clearly drawn, and convincingly supported by evidence. Readability: All manuscripts must be well-organized, well-written, and readable. © 2002 Institute for Pedagogy and Andragogy, University of Belgrade, Faculty of Philosophy. All rights reserved. With the exception of fair dealing for the purposes of teaching, research or private study, criticism, reviews and citations, no part of this publication may be reproduced, stored, or transmitted in any form or by any means without the prior permission in writing from the copyright holder. There is no copyright fee for translation or reprinting, but the Editorial Board should be informed. Annual subscription rates: 80€ (VAT included). For the payment details please contact Institute for Pedagogy and Andragogy. Andragogical Studies © 2017 All Rights Reserved.